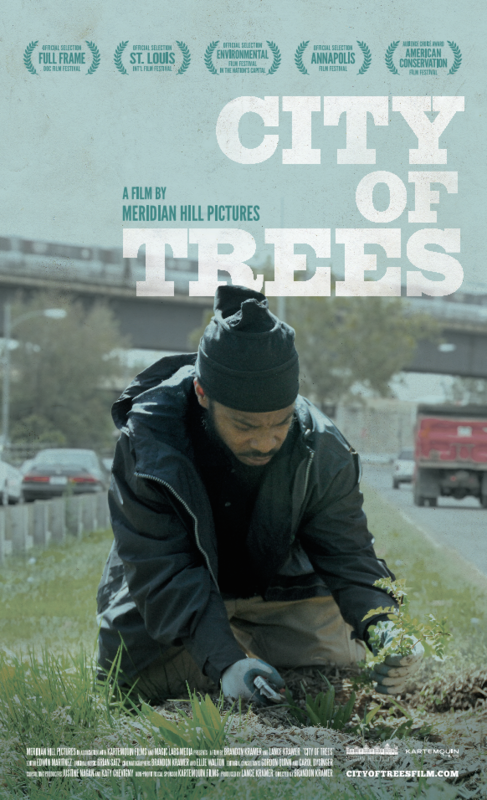 The filmmakers behind City of Trees worked with 275 hours of footage, comprised of the individual stories of 12 subjects involved in a "green" job-training program in the communities hardest hit by the recession, before completing the final 76 minute film. A portion of their creative process took place at our Kartemquin Lab program, during which members of the Kartemquin community gather to discuss and critique the work-in-progress of an independent filmmaker. In the fall of 2014, the filmmakers brought a cut of the film to a KTQ Lab. In the following interview City of Trees director and Meridian Hill Pictures artistic director Brandon Kramer discusses the inspiration of the film, the challenges of honoring the complexities of the work of Washington Parks & People and both the program's participants and how they ultimately decided to lean into and embrace a more complicated–and ultimately more authentic–storyline. You can see this final version of City of Trees at our Kartemquin Fall Festival on November 3, at 8:30pm at ArcLight Cinemas! What was the initial inspiration behind City of Trees? We met [City of Trees participant] Steve Coleman when we first moved into the Josephine Butler Parks Center in 2010. He told us his non-profit Washington Parks & People had just gotten a federal grant to create this green job-training program in DC. They had two years to train over 100 District residents struggling with long-term unemployment. They knew they wanted to help people who had major impediments to employability. Within that demographic they looked for people who were really trying to find work and leverage the training to better their lives. Lance and I really connected with this idea that Steve was trying to use the resources from the national stimulus to create a change within people’s lives here in DC. That was the kind of storytelling we were interested in. How can we explore these bigger issues on a local level through the complexities of people’s lives? What were some of the complexities you faced in the edit? All together we shot approximately 275 hours of footage. There were six characters in the final film but we had been filming with closer to 12. So we're seeing all of their different life experiences and the ways they’re intersecting with the program and we were constantly trying to understand what was happening with all these people, how they connected to one another. I was constantly asking, what is the story I’m following and what is that central question that I’m asking? Is this a story about how greening the community is impacting the community? About how a group of people who have been left out of the economy are given a second chance? Is it a film about how trying to do good in a community is really hard and the struggles and pitfalls of that? What happens in the edit is you wind up saying, ‘this is what the film is about.’ There was an early cut where we said this is a film about how this program has transformed these trainees' lives. That version is heavily rooted in the trainees’ point of view. I think we went in that direction first because there is a norm and expectation in these kinds of films about a nonprofit or a program that you should only tell the story of the program participants. We had all this rich and complicated footage of the staff but because of this norm in storytelling, we didn’t use it. That was a much simpler version of the film. We took that film to Kartemquin to the KTQ Labs screening in the fall of 2014. Gordon Quinn had seen the early, early cut, a three hour version that had everything in there. Eddie and I worked for almost a year to get the next cut ready to bring to Chicago. When we took it there Gordon, in this beautiful and really hard moment, said: “You guys have all this footage about the complexities of how hard this program is, not just from the trainees' perspective but from the staff perspective. I’ve seen this footage about this beautiful and messy intersection. I know you’ve got the goods." He saw this thread in the film that I was very interested in when I was filming. Eddie and I didn’t had the confidence to cut that film together because it was a much more difficult, sensitive story to tell. But Gordon said, “Look — there are a thousand different films out there about a program training unemployed minorities and underserved people in different skills. You guys spent all this time digging on a deeper, more complicated and unrevealed part of this work, which is the intersection of the people trying to change lives and the people they’re trying to change. I really think you guys are doing a disservice to what this story could be by simplifying it." And we realized he was right. Gordon gave us the confidence to reconnect with a gut line of inquiry we had followed when we were filming, but had lost the courage to pursue at some point along the way in the edit. How did you find that more complicated storyline? Over the next six months of editing we attempted to make the film about the story of trying to bring change to a community. We knew we couldn’t just tell one side of the story, we had to tell the story of Steve and Karen along with Michael and Charles. In City of Trees you’re seeing multiple perspectives and you’re seeing how all of them are fighting for what they’re trying to accomplish in very different ways. And that is a much more difficult film to make because the film is largely about communication and where communication works and where people struggle with it. To make an authentic film about communication you have to make sure that the way you see each person communicating or not communicating is very true to what happened, because every person thinks what happened is different. So my job is to understand: what does Charles think happened? What does Michael think happened? So how do you think you will apply the lessons you learned making City of Trees to other films in the future? I think what we’ve really looked to do is understand how we can take these ethics and this approach that we wrestled with through making City of Trees, and continue building on it with each new film. Gordon and the filmmakers at Kartemquin did so much to help us learn these kinds of ideas through sharing from the wealth of their experience over the years navigating similar challenges. There are a lot of easier ways to tell a story. But we’re not really interested in cutting corners or abiding by conventions that we don’t think are actually helping move the conversation forward. We have so much respect for what Kartemquin has done for the Chicago filmmaking community and the impact KTQ has had in the field over all these years. KTQ was a major inspiration for us to start Meridian Hill Pictures in DC. Get your tickets to see City of Trees' Chicago Premiere HERE!